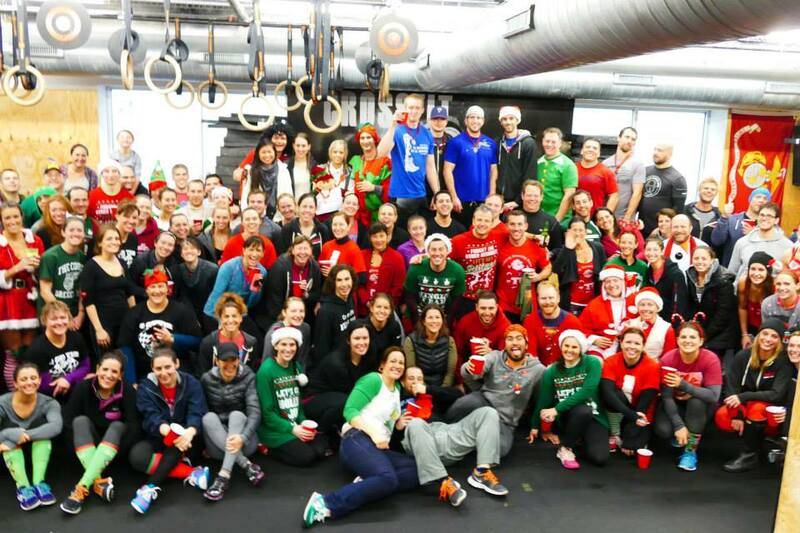 Tell me if you think this is a good idea: A team of four mamas with a couple hundred other crossfitters, gathered together on a Saturday morning to celebrate the season. Racing around the suburbs of Philadelphia (amidst determined holiday shoppers who, occasionally, consider stop signs mere suggestions) in the sleet and rain with shopping carts, kettlebells, free weights, and jump ropes. 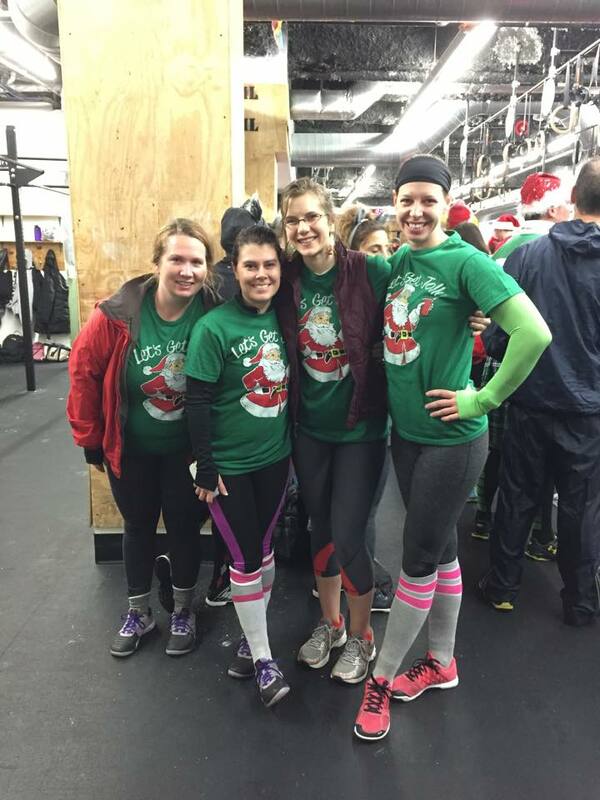 Consuming some holiday beverage and food (such as smoked yule logs–I kid you not–the memory itself makes me nauseated) of choice, answering trivia questions, in addition to completing a benchmark WOD at each of the nine stations. We didn’t think so either. My soaking shoes felt like there were going to freeze onto my feet. I continued to taste the (for lack of a better word) tangy flavor of the non-alcoholic mulled wine at station 7 in the back of my throat for hours. 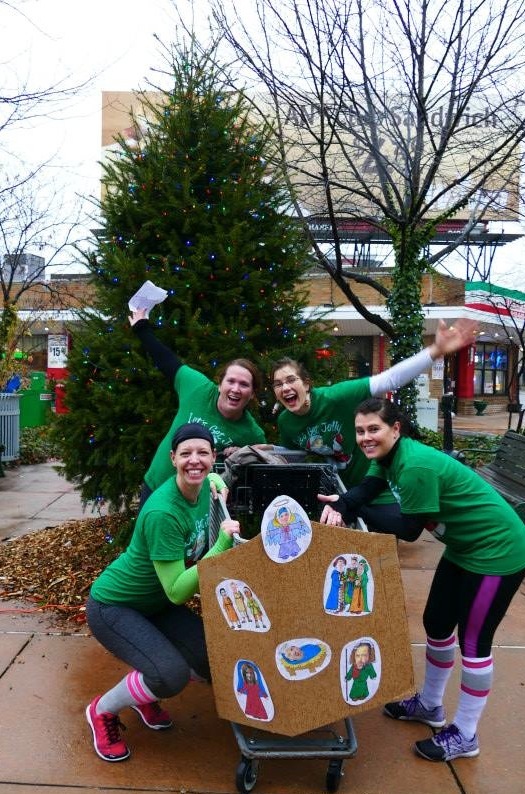 And, carrying the kettlebell back to our parked cart at station 4, I truly thought I would lose the mixture of eggnog, peppermint schnapps, and wassail sloshing up to the fundus of my stomach. Probably the best babysitting money I’ve ever spent. (John working the overnight previously was not a deterrent.) So worth being a part of camaraderie and revelry of team “Jesus and her disciples” (apologies for any offense; we rarely take advantage of my last name). And it turns out there is a correlation between experience pushing a stroller and ability to maneuver a shopping cart around sidewalks in the rain. I didn’t feel right posting pictures focusing on other individuals, but perhaps this group shot captures a glimpse of the creativity of costume and shopping cart decoration (not pictured). I felt a little embarrassed not putting much effort into preparation, but (as you might notice) I rediscovered my beloved troll doll Santa earrings from second grade. I *love* the “Jesus and her disciples” team name!